Nottingham ( ) is a city and unitary authority area in Nottinghamshire, England, 128 miles (206 km) north of London, in the East Midlands. Nottingham has links to the legend of Robin Hood and to the lace-making, bicycle (notably Raleigh bikes) and tobacco industries. It was granted its city charter in 1897 as part of Queen Victoria's Diamond Jubilee celebrations. Nottingham is a tourist destination; in 2011, visitors spent over £1.5 billion – the thirteenth highest amount in England's 111 statistical territories. In 2015, Nottingham had an estimated population of 321,550 with the wider urban area, which includes many of the city's suburbs, having a population of 915,977. Its urban area is the largest in the east Midlands and the second largest in the Midlands. The population of the Nottingham/Derby metropolitan area is estimated to be 1,610,000. Its metropolitan economy is the seventh largest in the United Kingdom with a GDP of $50.9bn (2014). The city is also ranked as a sufficiency-level world city by the Globalization and World Cities Research Network. 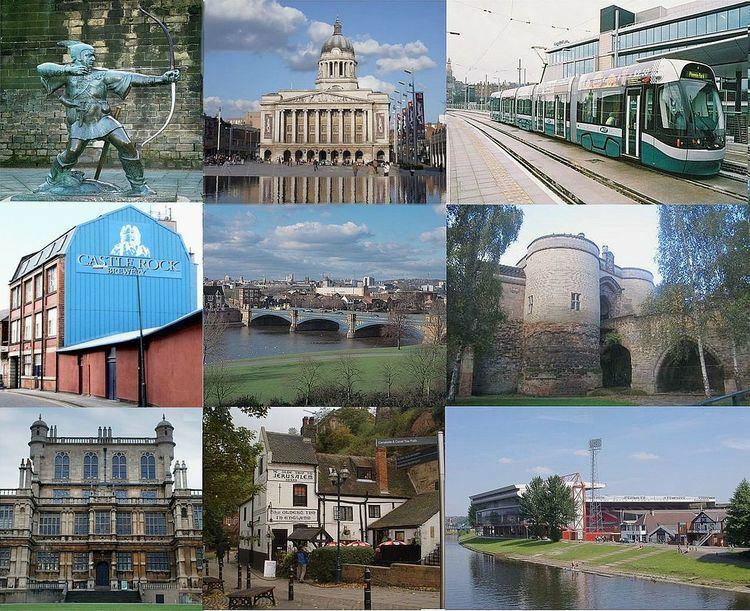 On 11 December 2015, Nottingham was named a "City of Literature" by UNESCO, joining Norwich, Melbourne, Prague and Barcelona as one of only a handful in the world. The title reflects Nottingham's literary heritage, with Lord Byron, D. H. Lawrence and Alan Sillitoe having links to the city, as well as a strong contemporary literary community, a thriving publishing industry and a vibrant poetry scene. Nottingham City Council is a unitary authority based at Nottingham Council House in Old Market Square. It consists of 55 councillors, representing 20 wards, who are elected every four years; the last elections being held on 7 May 2015. The city also has a Lord Mayor who is selected by city councillors from among themselves. The position is ceremonial and has no formal power or authority. Nottingham has three UK parliamentary constituency seats within its boundaries. Nottingham North has been represented since 2017 by Labour MP Alex Norris, Nottingham East since 2010 by Labour MP Chris Leslie and Nottingham South since 2010 by Labour MP Lilian Greenwood. There are weather-reporting stations close to Nottingham – the former "Nottingham Weather Centre", at Watnall, about 6 miles (10 km) north-west of the city centre; and the University of Nottingham's agricultural campus at Sutton Bonington, about 10 miles (16 km) to the south-west of the city centre. The highest temperature recorded in Nottingham (Watnall) stands at 34.6 °C (94.3 °F), whilst at Sutton Bonington stands at 34.8 °C (94.6 °F) both recorded on 3 August 1990, and the record high minimum temperature is 19.9 °C (67.8 °F) recorded in August 2004. On average, a temperature of 25 °C (77 °F) or above is recorded on 11.0 days per year at Watnall (1981–2010), and the warmest day of the year reaches an average of 29.4 °C (84.9 °F). For the period 1981–2010 Nottingham (Watnall) recorded on average 42.9 days of air frost per year, and Sutton Bonington 47.1. The lowest recorded temperature in Nottingham (Watnall) is −13.3 °C (8.1 °F) recorded in January 1963 and January 1987. The record low maximum temperature is −6.3 °C (20.7 °F) recorded in January 1963. For the period of 1981–2010, the coldest temperature of the year reaches an average of −6.6 °C (20.1 °F) in Nottingham (Watnall). Four further education colleges are located in Nottingham. Bilborough College is solely a sixth form college. 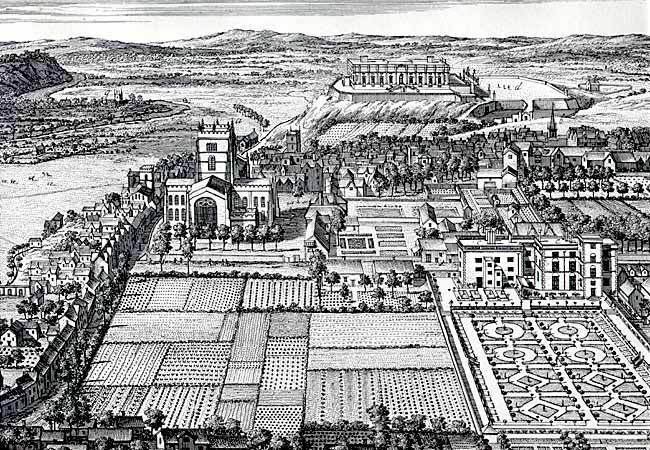 Central College was formed from the merger of South Nottingham College and Castle College. New College was formed from a merger of four smaller further education colleges.. The Confetti Institute of Creative Technologies is a further education college that specialises in media, and is owned by Nottingham Trent University. Nottingham also has dozens of sixth-form colleges and academies that provide education and training for adults aged over sixteen. Nottingham is home to the headquarters of several companies. One is Boots the Chemists (now Alliance Boots). Other large companies include Chinook Sciences, GM (cricket bats), Pedigree pet food company, American clothing VF Cooperation, Chinese-made automobiles Changan Automobile, the credit reference agency Experian, the energy company E.ON UK, the betting company Gala Group, the amusement and gambling-machine manufacturer Bell-Fruit-Games, the engineering company Siemens, the sportswear manufacturers Speedo, the high-street opticians Vision Express and Specsavers, the games and publishing company Games Workshop, the PC software developer Serif Europe (publisher of PagePlus and other titles), the Web hosting provider Heart Internet, the American credit card company Capital One, and the national law firm Browne Jacobson. Nottingham is also the home of the Nottingham Building Society (set up in 1849), the offices of HM Revenue and Customs, the Driving Standards Agency, BBC East Midlands offices, and formerly, the Government Office for the East Midlands. Nottingham was made one of the UK's six science cities in 2005 by the-then Chancellor of the Exchequer (and later Prime Minister), Gordon Brown. Among the science-based industries within the city, is BioCity. Founded as a joint venture between Nottingham Trent University and the University of Nottingham, it is the UK's biggest bioscience innovation and incubation centre, housing around eighty science-based companies. Until recently, bicycle manufacturing was a major industry, the city being the birthplace of Raleigh Cycles in 1886, later joined by Sturmey-Archer, the developer of three-speed hub gears. However, Raleigh's factory on Triumph Road, famous as the location for the filming of Saturday Night and Sunday Morning, was demolished in Summer 2003 to make way for the University of Nottingham's expansion of its Jubilee Campus. The schools and aerial photographers, H Tempest Ltd were Nottingham-based for many years, until relocating to St. Ives (Cornwall) around 1960. Nottingham City Council, owners of the Broadmarsh Centre, have been attempting to redevelop it for "almost two decades". Work on redeveloping Broadmarsh, at a cost of £400,000,000 (creating 400 stores, 136,000 m2 of shopping space), was due to start in 2008. However, the economic downturn meant that redevelopment was delayed throughout from 2008-2010. In the light of the Victoria Centre's redevelopment plans, Westfield announced in 2011 that it was once again planning a £500,000,000 development of Broadmarsh, which would start in 2012. This, however, did not take place either. Broadmarsh was finally sold to Capital Shopping Centres, the owners of the Victoria Centre. The purchase prompted an investigation by the Office of Fair Trading and the Competition Commission, who were concerned that the company's monopoly over the city's shopping centres could have a negative impact on competition. CSC subsequently rebranded itself and the centres use the "Intu" name. Although the new owners wished to start the planned development of the Victoria Centre, Nottingham City Council insisted that Broadmarsh must have priority, with the Council offering £500,000,000 towards its redevelopment. The deputy leader of Nottingham City Council said the Council would withhold planning permission for the development of the Victoria Centre until they saw "bulldozers going into the Broadmarsh Centre." The Creative Quarter is a project started by Nottingham City Council as part of the Nottingham City Deal. Centred on the east of the city (including the Lace Market, Hockley, Broadmarsh East, the Island site and BioCity), the project aims at creating growth and jobs. In July 2012, the government contributed £25,000,000 towards a £45,000,000 venture capital fund, mainly targeted at the Creative Quarter. There is a Cineworld and a Showcase in the city. Independent cinemas include the Arthouse Broadway Cinema in Hockley, and the four-screen Art Deco Savoy Cinema . Nottingham also has a selection of smaller venues, including the Albert Hall (800-capacity), Ye Olde Salutation Inn, Malt Cross, Rescue Rooms, the Bodega, the Old Angel, the Central, the Maze, the Chameleon and the Corner. 1960s Blues-rock band Ten Years After formed in Nottingham, as did the 1970s pop act Paper Lace and the critically acclaimed Tindersticks. Since the beginning of the 2010s, the city has produced a number of artists to gain media attention, including; Jake Bugg, London Grammar, Indiana, Sleaford Mods, Natalie Duncan, Ady Suleiman, Dog Is Dead, Saint Raymond, Childhood, Rue Royale, Spotlight Kid and Amber Run. Wollaton Park in Nottingham hosts an annual family-friendly music event called Splendour. In 2009 it was headlined by Madness and the Pogues. The following year it was headlined by the Pet Shop Boys and featured, among others, Calvin Harris, Noisettes, Athlete and OK Go. In 2011, it featured headline acts Scissor Sisters, Blondie, Eliza Doolittle and Feeder. In 2012, performers included Dizzee Rascal, Razorlight, Katy B and Hard-Fi. In 2014, Wollaton Park hosted the first ever No Tomorrow Festival, featuring the likes of Sam Smith, London Grammar and Clean Bandit. Nottingham is known for its hip-hop scene. Rofl Audio Recording Studios opened in 2013. Nottingham has hosted an annual Asian Mela every summer since about 1989. 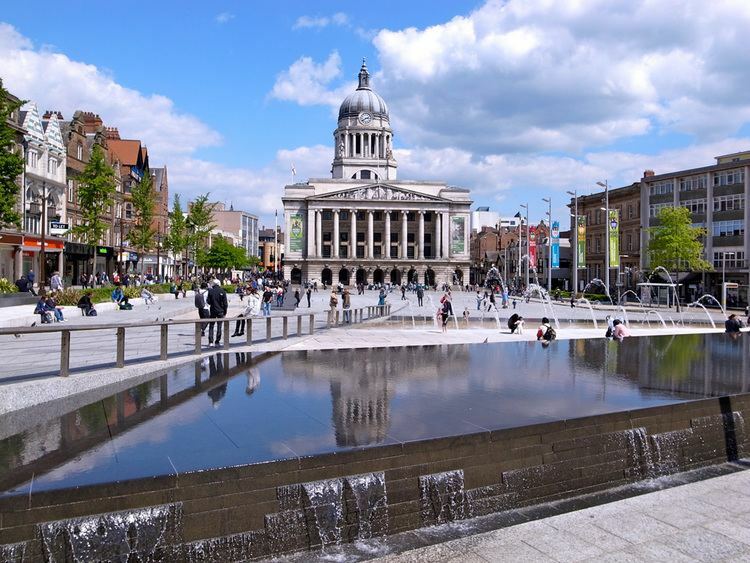 Nottingham also hosts a parade on St Patrick's Day, Fireworks at the Chinese New Year, Holi in the Park celebrating Hinduism, a West Indian-style Carnival, and several Sikh events. In October 2015, Nottingham was named as the official Home of Sport by VisitEngland for its contributions and recognition of the developments of the games of Football, Cricket, Ice Hockey in Britain, Boxing, Tennis and general Athletics, Gymnastics and Water sports.